A couple weeks ago, Aleksandr Golts wrote in Ogonek about the situation in which Defense Minister Shoygu finds himself. Golts has two main points. First, small policy changes can lead to big ones which unravel former Defense Minister Serdyukov’s positive reforms. Second, Shoygu in uniform is a setback to real civilian political control of Russia’s Armed Forces. Golts says that, although officers had their pay raised 2-3 times and tens of thousands received apartments thanks to former Defense Minister Serdyukov, the military still clamored immediately for Shoygu to change every decision made by his predecessor. Chairman of the Duma Defense Committee, KPRF member, ex-admiral Vladimir Komoyedov called for lengthening the conscript service term. Generals associated with retired Marshal Dmitriy Yazov demanded an expert review of the results of Serdyukov’s tenure. However, Golts notes both President Putin and Prime Minister Medvedev gave Serdyukov’s painful reforms high marks (Smirnov in Gazeta made the same observation). So, concludes Golts, it was a signal to Shoygu that no fundamental review of them is needed. This left Shoygu in a complicated situation. So Shoygu has taken some minor decisions to placate those seeking the pre-Serdyukov status quo. But these small steps, writes Golts, can have big consequences. Reestablishing the Main Directorate for Combat Training (GUBP or ГУБП), for example, will ultimately undercut the authority of the main commands of the services and branches as well as (and more importantly) of the four new MD / OSK commanders. Reversing Serdyukov’s significant cuts in the Russian military educational establishment will put unneeded officers in the ranks to reanimate cadre units and the mass mobilization system. The Defense Minister’s civilian status, Golts continues, was the very first step in establishing if not civilian, then at least political control over the military. But establishment of civilian control takes more than one civilian minister. It takes civilians who formulate decisions for military men to execute. He points to Serdyukov’s attempt to separate civilian and military functions and competencies in the Defense Ministry. One has to agree that Shoygu’s three-month tenure consists of little more than examining and questioning every decision made by Serdyukov. 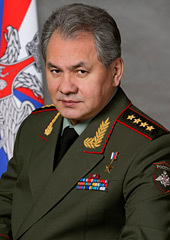 Shoygu’s status as civilian or military is more interesting. He passed through the general’s ranks to four stars between the early 1990s and early 2000s. More unclear is how or why he got the first star. He had been a strictly civilian and party figure. Many readers may not realize Shoygu’s MChS is a “military” (militarized or paramilitary) ministry where servicemen and officers with ranks serve like in the Armed Forces, MVD, or FSB. So, at some level, it may not be fair to claim anyone “returned” his rank, or forced him to wear a uniform. The question is does an MChS rank carry any weight or “authority” in the Defense Ministry? Recall Sergey Ivanov never wore his SVR or FSB General-Colonel’s uniform as Defense Minister. Shoygu remains an inherently civilian and political figure whom President Putin turned to in a pinch and trusts to keep the lid on at the Defense Ministry. Russians joked in November that the old Minister of Emergency Situations was clearly the right guy for the job when the Oboronservis scandal broke and Serdyukov had to go. One shouldn’t worry about Shoygu and civilian and political control of the military. The slippery slope of undoing Serdyukov’s positive efforts, on the other hand, is concerning. This entry was posted in Civil-Military Relations, Command and Control, Serdyukov's Reforms and tagged ГУБП, GUBP, OSK, Sergey Shoygu, Unified Strategic Commands. Bookmark the permalink.